Would You Like To Learn To Crochet? If you caught my post a few days ago (about my latest Creative passion – Crochet), then I thought it might be an idea to share a few more links to learn to how crochet yourself. Here are the basics to get you started. This is how to start off every cool crochet project . . . The next most useful technique to learn is how to turn a series of Slip Stitches into a circle. SO many crochet projects start with a circle. This is the one stitch that you will help you make Granny Squares or a Granny Rug. Once you’ve mastered this little baby, you will breeze through Trebles and Double Trebles. Would you like to attempt to make a Granny Square? This is my favourite video – for the instructions on how to crochet a Granny Square. 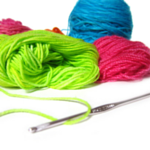 So . . . . . . . . . . . . are you going to have a go at crocheting? If I can learn – you can totally do it. You know I’d love to see what you make. Upload a photo in the comments or share on my Facebook page. I’d love to see what you Create.